Illustration courtesy of Klipsch Group, Inc. I recently completed a limited downsizing and modernizing of my home stereo (two-channel) music system. My listening room is small and it has become increasingly cluttered over the years. I had not bought any new components in about 20 years, so it was interesting to see what has transpired in home stereo. I have little interest in multi-channel home theater, which seems to dominate the audio world at this time, as my TV watching is largely confined to sports events and documentary programming (ESPN, Versus, Fox Sports, Fox News, NatGeo, Discovery, History, Military, Science, Animal Planet and the like). I cannot see much advantage in listening to narration or commentary in 20-20,000 Hz high fidelity, so I prefered to stay with a two channel (stereo) sound system that better meets my needs for music reproduction. Incidentally, full-range stereo (two channel) loudspeakers can do very well as a home theater sound system, without any help from side and back speakers, when fed the line output from a DVD player or digital cable/satellite box. Their stereo image is good, eliminating the need for a center channel and they don't need a sub-woofer. The sound quality is much better than the noise projected from most home theater surround speakers. Of course, one needs serious, floor standing, loudspeakers to reproduce the required big theater sound! However, I digress. The point of my recent audio exercise was to simplify and downsize my home stereo system. As a start, I gave away my seldom used Pioneer PL-41 turntable, my Harmon-Kardon CD491 cassette deck and all associated program material. These were both very high-end components in their day, but that day has passed. Unlike many audiophiles, I immediately perceived the overwhelming advantage of the CD digital music format and have never looked back, despite the recent, modest resurgence in the popularity of vinyl. The remainder of my music system then consisted of a pair of Altec-Lansing A7-500 ("Voice of the Theater") loudspeakers with 15" woofers and 500 Hz exponential horns, Monster Cable speaker wires, Marantz 250M power amplifier, McIntosh MQ-101 environmental equalizer, McIntosh C-26 pre-amplifier, Marantz 125 AM/FM tuner and Sony CD620 ES CD player. All fine components in their day, to be sure. Choosing the right loudspeakers is not a simple task. The speakers are where the sound comes from and they are, by far, the most important component in any stereo system. They are also the biggest source of distortion, coloration, un-natural resonances and other problems, as well as interacting with the listening room in which they are used. I have a long standing design bias in favor of horn-loaded drivers for the midrange and high frequencies, as they project more direct sound to the listener and are usually more efficient than direct radiating drivers. I like substantial woofers in a bass reflex enclosure. I also prefer two-way (one crossover point) systems to three or four-way systems with multiple electrical crossovers. Every crossover point creates distortion and frequency response irregularities, so I like to minimize them. Size matters in speaker system design, with bigger enclosures being better. A large enclosure requires fewer design compromises in other areas. Unfortunately, very large speaker boxes such as the Altec Voice of the Theater, JBL S8R, and Klipschorn take up a lot of floor space and may not be optimum for use in smaller listening rooms. That was my motivation for finally replacing my excellent A7-500's with tower type speakers that have a smaller footprint. Low frequency drivers must move a lot of air to be audible to human ears. It is not difficult to make a small driver with, for example, a 4" diameter cone resonate at a low frequency (say 30 Hz) by making its cone heavy, but its acoustic output is inadequate, because it does not move enough air to significantly impact your eardrums. Large woofers are better than small ones. Full-range tower speakers, with their narrow front profile, cannot accommodate large woofers, so they generally use multiple smaller woofers to move a reasonable amount of air. Unfortunately, whenever you have multiple drivers reproducing the same frequency, it can cause problems. Other things being equal, two larger woofers in a tower design are theoretically better than three or more smaller ones. Based on my experience, Altec-Lansing, Infinity, JBL, Klipsh, Electro-Voice, Cerwin-Vega, Bowers & Wilkinson (B&W), Quad and Warfedale were loudspeaker companies that immediately came to mind. The first six are (or at least were) U.S. companies, while the last three are U.K. based. Unfortunately, Electro-Voice appears to be entirely out of the home speaker market, although they still offer a wide range of professional (concert hall and stadium) sound reinforcement systems. Altec has been bought and sold several times since their glory days and now seems to be primarily marketing a line of cheap computer and i-pod speakers. This once great American company no longer manufacturers any high fidelity home loudspeakers. Quad and Warfedale seem to have solid product lines, but are not distributed in my area. JBL has also fallen on hard times and is now owned by Harmon International, as is Infinity. Neither offers the wide range of high quality home stereo speakers upon which their reputations were built. According to my research, the speakers of both brands are now produced in Red China. In fact, most home loudspeakers are now made in China, which I found shocking. The last time I had looked, U.S. and U.K. speaker manufacturers dominated the high fidelity market. From my original list of speaker brands, that left Klipsch and Cerwin-Vega, both U.S. companies, plus B&W from the U.K. In the course of my research, various models of Paradigm (Canada) and PSB (Canadian HQ, Chinese manufacture) speakers came to my attention and were duly considered. 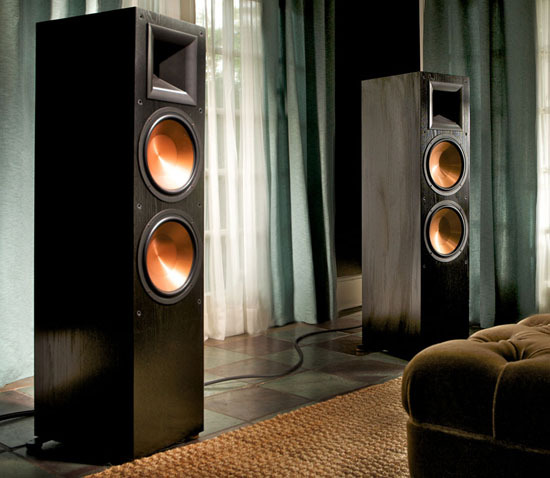 Ultimately, I chose Klipsch Reference Series RF-7 II loudspeakers for my revised stereo system. These modern towers are finished in furniture grade, black ash, wood veneer and built in Hope, Arkansas, U.S.A. Each internally braced enclosure contains two cast frame, 10" woofers (roughly equivalent to a single 14" woofer) and a single upper mid/high frequency (1200-24,000 Hz) horn in a two-way configuration with a 1200 Hz crossover point. The enclosure is a bass reflex design with dual rear-firing ports. As tower speakers go, they are large systems. They stand about four feet tall and weigh almost 90 pounds each, but they are only 11-5/8" wide and occupy much less floor space than my old Altec A7-500's. How "good" are they? My definition of a good Hi-Fi loudspeaker is one that can accurately reproduce the musical information it is fed. If it is fed a low quality, distorted, compressed recording, it should produce a low fidelity, distorted and compressed sound. If fed a high fidelity signal with wide dynamic range and frequency response, that is the sound that should come out of the speaker system. In other words, contrary to the subjective verbiage used in audio magazine reviews, a loudspeaker cannot sound "musical" or like a live performance, per-se. It is a transducer, converting an electrical input signal into sound waves we can hear, ideally without adding or subtracting from the information it was fed. Of course, no loudspeaker does this perfectly or even very close to perfectly. Loudspeakers are the least accurate link in our component chain, from the program source to our ears. To complicate matters, we all hear sounds differently and play our music at different listening levels. My rather crowded, mostly bookshelf lined, wall-to-wall carpeted, listening room has large windows with mini-blinds front and rear and measures about 14'x14'. My listening position is 8.5' from the speakers, which are 6.5' apart and angled directly at my listening position. My reference listening level is 80 db SPL for high level passages, "A" weighted, SLOW response, per my SPL meter at my listening position. My loudest listening volume is about 90 db SPL at my listening position. These SPL figures are for "mean loud passages," not transient peaks, which are naturally higher.